This is a set of tools for handling NRPN controller input and output. There are interfaces and modules for receiving and sending NRPN controller data. 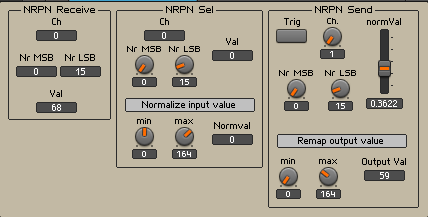 I hope some day these things will be more comfortably integrated into the native Reaktor modules. Until then, I hope the interfaces and modules may be of some help to those who want (or need) to control certain hardware synthesizer or controller that support (or insist on) NRPN Midi data. I am one of them.